I mean…it’s Aerosmith. There’s not much else for me to say. That’s never stopped me before, though. 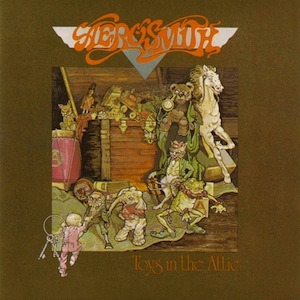 This Dad Rock Tuesday, I’ve been assigned Toys in the Attic, Aerosmith’s third record, released in 1975. Apparently, this album is of the heavy metal genre, which is news to me. That’s according to Wikipedia, so take it with a grain of salt. I have to write about something, so I’m gonna run with that. When I think of heavy metal, I think of Mastodon (and this comic), not of mid-’70s bands with members who wore really shiny pants and toted flamboyant mic stands. I should probably be writing in the present tense—the band still tours—but they’re just… so…old. Anyway, where was I before I went on a tangent from my original tangent? Right, heavy metal and Aerosmith’s music’s classification as such. I heard maybe one metal riff on this record (“Round and Round”), which is even kind of a stretch. So I’m going to end this here. CNN BREAKING NEWS ALERT: WIKIPEDIA GOT SOMETHING WRONG. In all honesty, disliking this record would do no good. As I stated earlier, it’s Aerosmith. It takes some effort to hate on an album, so I’m just not going to do it in Toys in the Attic’s case. There’s plenty of catchy stuff on here that I only feel a little bad about liking. But not even the overpowering feeling of laziness that comes with Thanksgiving Break can stop me from questioning this album’s closing number. “You See Me Crying” sees Steven Tyler taking on a falsetto of sorts—it’s pretty indescribable. I thought it was a joke at first. It’s like he’s growling or something. God help us all. Mr. Ear: Why does heavy metal make you think of a cartoon about a teenager with a Captain Ahab delusion? Hint: If it evokes faux-religious iconography, Nordic or Celtic mythology, wears spandex, sits on a ridiculously high drum stage, makes extensive use of skeletons and skulls, sings like an untrained opera singer or a malfunctioning vacuum cleaner, plays dual guitar leads, sticks out its tongue at odd moments, uses long hair to cover an emerging bald spot and has played Rock In Rio, it is probably heavy metal. Exhibit A: http://www.youtube.com/watch?v=sJMJ0iBvIa0. Aside from personally detesting Steven Tyler as a singer, Aerosmith is in no way a “heavy metal” band. They were perhaps the first and most successful and enduring of the many, many hair bands that would later come to overtake the ‘80s. In that way, I guess they were pioneers. From my understanding “Toys in the Attic” was one of the better efforts, and well before the band and Tyler became a complete caricature.